@everydayreading // I love the feed of this children's librarian turned homeschool-mom. Janssen posts the most gorgeous photos of her kids, gives great book recommendations, craft ideas and recipes. @momtog // This is one of those accounts that every mom that wants to take better photos of her children should be following. Started by the amazing Drew B, this account lets real moms and photographers take over and give advice, tips and tricks about how to improve your photography, how to get the perfect shot and how they do it. 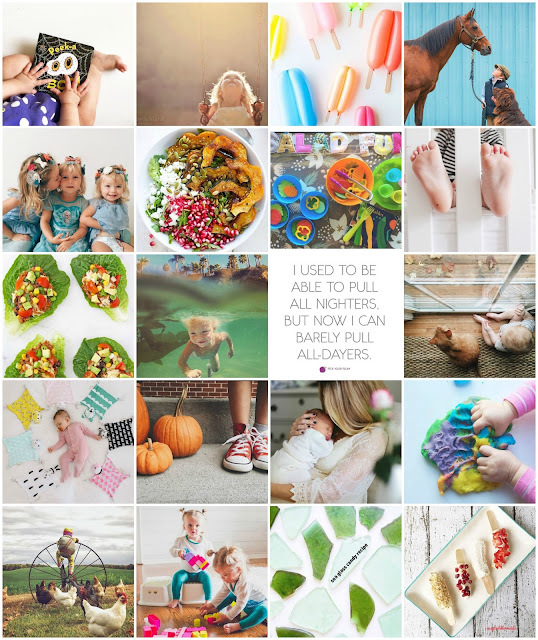 @smallfryblog // This feed is a great place to find the hippest products, clothing and projects for you little one. They are always on top of the latest trends and share great finds/sales. @northwestmommy // I'm in love with this family and their giant dogs and horses. I can't get enough of Stasha's beautiful images and it makes my heart happy to see a family love and interact so much with their pets. @melanieburk // Mama of three gorgeous little girls, Melanie's feed is filled with beautiful images of family and fun, peppered with support, encouragement and humor. I especially love her #unexpededtype posts that she does to teach the kids letters/word. @bestfriendsforfrosting // This gorgeous feed is filled with beautiful images of projects, recipes, parties, fashion and creative ideas. @totschool // Possibly my favorite new discovery on Instagram, this feed is packed with creative ideas, activities, projects and educational crafts for little kids. Each week is a theme and all the activities that week relate to the theme. Perfect for preschoolers. @imkaceyjane // Another new discovery for me, this feed is dreamy! So many gorgeous photos of her daughters and life in the Midwest. @superhealthykids // One of my favorite places to go for healthy, delicious meal and snack ideas for kids. This is where I find my ideas on how to get my kids to eat more vegetables. @imoments // This feed of ALL iphone photos will blow you away. The underwater photos alone are absolutely mesmerizing, haunting and gorgeous. @pickyourplum // This is a great site for finding amazing deals on fashion, crafts, decor, kids stuff and party products. Plus, they always post the funniest quotes and sayings that make me smile. @burtsbrisplease // This gorgeous feed is filled with the most beautiful photos of a little boy and a cat (and other stuff). I cannot get enough of Leo. @ministyleblog // This feed is all style, all the time. If you're looking for the cutest, trendiest, most adorable clothing and accessories for kids, this is the place. @one_wild_and_precious_life // Another amazing mom photographer that captures beautiful moments with her adorable little boy. I'm obsessed with their adventures. @sparklingfootsteps // New mama Lynzy just started posting nightly topics for new moms as part of her #latenightnursingfeed hashtag, where moms can connect with others in the middle of the night, when it's sometimes so lonely with a new baby. I spent an hour the other night reading all the comments on one post and bawling my eyes out. @oliviasfoster // I love this feed by a Sydney nanny, filled with amazing DIY projects, crafts, recipes, experiments, boxes and projects for kids. I love everything about this. @childhoodunplugged // Another photography feed, filled with gorgeous photos of kids unplugged and having adventures outdoors and without batteries. I love getting ideas of fun things for my kids to do (and ideas for beautiful photos to take) from this account. @kickeepants // If you follow me on Instagram, you know my love/obsession with this brand their amazing clothing and pajamas. My children live in KicKee Pants and I love following the company and the awesome community that they've built. @thepapermama // This is another feed filled with gorgeous photos of really fun things to do/make/bake with your kids. @easytoddlermeals // My go-to place for getting ideas of incredible foods my kids will actually eat (and that I want to eat too). They also have really great little videos showing you how to make some of the food and how easy it all is. Tomorrow, I will be taking over the Instagram feed of one of these amazing accounts! Please please please head to my account tomorrow (@sara_mccarty) to find out where I'll be and pop over and say hi! I'd love to hear from you! i cant WAIT for your takeover!!!!!!! and i wasnt following some of these. but i sure am now!!! So fun!!! I'm so excited to find out where you'll be taking over! Thanks for all of these amazing suggestions!! So many of these are new to me! Thank you for these amazing finds. Amazing feeds!! Holy cow I don't know that I'm following any of these people! But you can bet I will be now! Can't wait to see who you take over!!! SO excited for your takeover!!! I'll be following along! I spend so much time scrolling through those little square photos! I love IG! congrats on the takeover! I follow a good amount of these accounts too, love them all! Im a little ashamed that I havent heard of any of these haha. Excited for your takeover though!!! Oh I am totally checking these out!! I just discovered you can log into instagram from your computer (I am so behind the times) so I will click over and check them out!! And now I'm following so many more gray accounts. Thank you!! Your take over yesterday was awesome!! Loved loved loved it. So fun! Instagram is the absolute best, and it is kind of ridiculous how much time I can spend scrolling through photos - I need to check out these new feeds!